Great Location for Wedding and Formal photography. Originally built for the 1915 Panama-Pacific Exposition. It is a beautiful garden setting with a small lake and giant structures reminiscent of Greek and Roman architecture complete with columns, colonnades, and a beautiful, imposing dome. Here is a beautiful video that illustrates the kind of beautiful photography / videography that can be captured in this setting. http://www.youtube.com/watch?v=Rg couples have actually been married here, but you can just go here with your wedding photographer and take pictures. It is open to the public. While we filmed the above linked video, a dozen or so parties showed up throughout the day to snap formal photographs--mostly wedding parties and other formal type occasions. If you are getting married in San Francisco or near by, it would be worth the time to get photographs there. 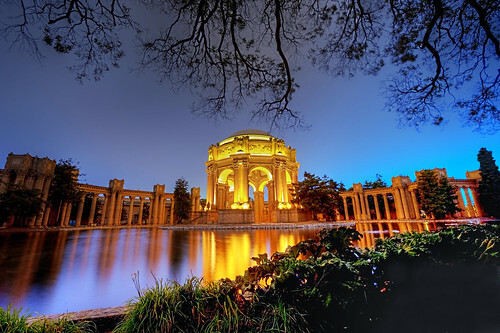 See The Palace of Fine Arts in San Francisco in Movies and Pictures.